It was bound to happen and the signs were already in front of us, Marvel Comics is rebooting their comic book “Marvel Universe”. Marvel Comics announced an all-new Secret Wars series would be taking place in 2015 and would later reveal that the story’s “Battleworld” would be made up of different stories from all throughout the Marvel canon. Now, Editor-in-Chief Axel Alonso and SVP, Executive Editor Tom Brevoort have revealed new details on the event series, which will have huge ramifications for the entire Marvel universe going forward. Many of those universes were previously teased when Battleworld was revealed, featuring the likes of Old Man Logan, Future Imperfect, and Age of Ultron vs. Marvel Zombies. Marvel has now debuted an interactive map of Battleworld further teasing the “countries” that will make up both the arena for Secret Wars and the building blocks of Marvel Comics continuity moving forward. To put it simply, Marvel Comics aren’t exactly rebooting so much as they’re taking the things fans like about the “regular” universe, the Ultimate universe, and all the stories of the past they enjoyed so fondly. Prepare for the All-New Marvel. Secret Wars is set to begin in May with Jonathan Hickman writing and art by Esad Ribic. 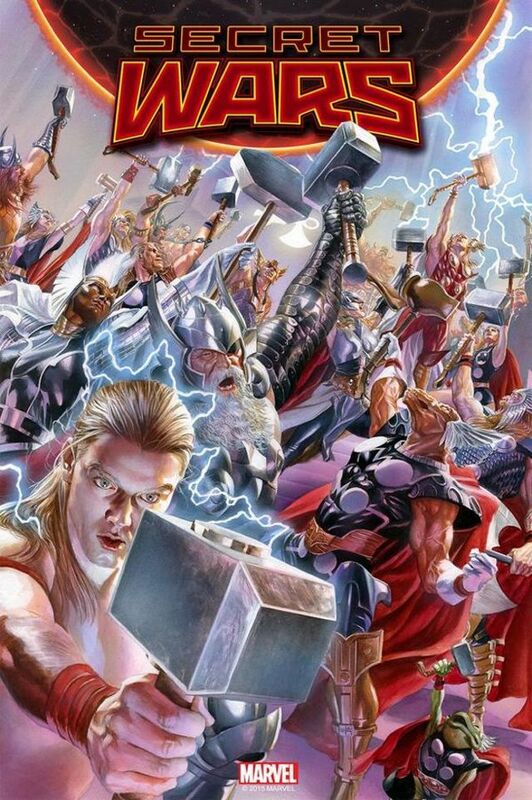 You can check out the full announcement video from today’s event in the player below along with the cover to Secret Wars #2 by Alex Ross featuring a Thor throw down!